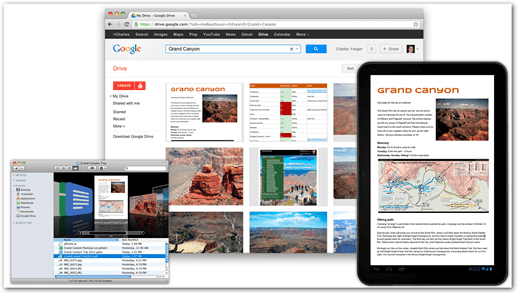 Google Drive has Officially Launched! We’ve been talking about Google Drive for weeks…. and this afternoon Google Drive was officially Launched! Just as expected, it offers up to 5 GB of cloud storage space for free, while larger capacities are available for various fees. The service Google is calling “Drive” is available at the moment for PC and Mac, as well as on Android devices. Google promises an iPad and iPhone version soon (and judging by the way Google moves, it won’t take too long until Apple approves it). Depending on your country, Google Drive may or may not be available yet from the Google Drive service page. I personally had issues getting in and was presented with the following message with an email notification. Google says that the service will work seamlessly with Google Docs and it will allow you to upload any files you like. It will have an emphasis on collaboration – everyone will be able to use the same file, and edit it together even if it’s a large one (which seems quite normal, considering the Google Docs integration). Except for the Google Docs integration, it doesn’t seem to be too different from other services on the market, but the fact that it has Google’s name on it should make most users feel more confident that it won’t be vanishing anytime soon with their data. Also, everything is searchable (uh… yeah thanks Google), and you can bet that will make things much easier for very large collections of files. If you need to buy more space (beyond the 5GB of free space), similar to other Google Products you can buy more space. These are all monthly rates. I’m curious what happens to your files that go over the 5 GB limit once you stop paying for a subscription. 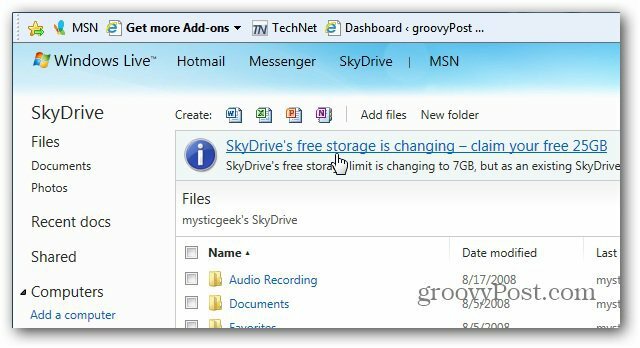 Today’s news comes after Microsoft announced yesterday the availability of 7GB for its SkyDrive. If you want the original 25GB of space they previously offered, make sure to opt-in quickly. Anyway, the service does look interesting (I can’t wait to have mine available), and you can find out more about from the short presentation video Google has posted. You can watch it below. What bums me out is that they are getting rid of the old plans. I have a 5 bucks a year 20 gig storage plan and I guess i can keep it until it lapses or whatever then we get switched to the new plans. If you have an android phone, go to the market and you should see an update for the google docs app. It is now Drive. Which, once you open it and get passed their pitch about drive, it looks just like the old google docs app. Seems to load quicker at least for me. general is not secure and shouldn’t be trusted.